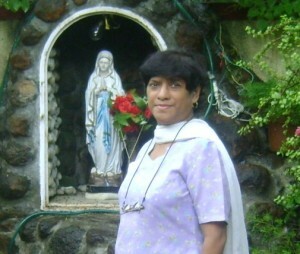 CCI-India has launched a prayer campaign seeking a miracle cure for Liby Mendonca, a former YCW from Pune. LIBERATA MENDONCA (Liby), who is married to Dominic Mendonca, Collaborator to CCI-India, has been unconscious and on life support for over a month. Her brain was damaged due to high blood pressure and the doctors have given up hope. Only a miracle can save her, doctors say. The prayer campaign proposed during the CCI India General Assembly at the Diocesan Pastoral Centre, Chennai, India on the 129th birth anniversary of Cardijn (November 13, 2011) commenced at 12 noon on the 14th November. CCI India hopes that a miracle will also provide evidence to push forward the process for the canonisation of Cardijn. Details of the prayer campaign can be found below. Ms Liberata Mendonca, known as ‘Liby’ is a former YCW of Pune in India and is married to Dominic Mendonca, former YCW and now Collaborator to the CCI-India. They have a daughter Michelle who is married with a daughter. They all live in Pune. On the 13th October 2011, Liby and Dominic went to their homeopathic doctor for a check up and soon after she felt bad and collapsed. She was rushed to hospital immediately and was admitted to the ICU. By that time her blood pressure had shot to the maximum and her brain was affected. Brain surgery was suggested but she was too weak to undergo the risky surgery. Fluids were drained from her head. From 13th October onwards, she has remained ‘unconscious’ and on ‘oxygen’ support. She opens her eye sometimes but gives no sign of recognition. She is still critically ill. Doctors have given up hope and say there is no scope for recovery. They suggest that she be taken home and kept in the surrounding she is familiar with. There is only a very small probability that in the course of time she may recognise the surrounding, people around her, etc. In short, Liby is in a ‘vegetative’ state with ‘oxygen’ supported life. Only a miracle can save her. We need that miracle right now. If we believe, we will see the miracle happen. CCI in its evolution has experienced a number of miracles through Cardijn’s intercession. We would like you and all your friends and contacts to pray to Cardijn to intercede on behalf of Liby for her total healing. We are sure our good Lord will grant a new lease of life toLiby through Cardijn’s intercession. Kindly say the prayer attached daily till Liby recovers. Ask your family and friends to pray for Liby. Pass ton his request to as many friends as possible so that we can soon witness the miracle of Liby walking home fully recovered. We can also prove to the world that Cardijn is a blessed saint who deserves due recognition. For those who are yet to know Cardijn, his brief profile is also given. Note: This Prayer Campaign to Cardijn began at 12 noon on Monday, the 14th November 2011 at the Diocesan Pastoral Centre, Santhome, Chennai, India.